Hot crack can be defined as cracking formed at high temperatures near the solidus of the metal, where the metal has coherence but is completely brittle. It can occur in weld metals and the heat-affected zone. Almost all metals (such as carbon steel, low-alloy steel, austenitic stainless steel, nickel alloy, and aluminum alloy) may, on any scale, suffer this defect. The lack of ductility at high temperatures causing the brittle condition near the solidus is usually due to the formation of an intergranular liquid film of an impurity, notably sulfur and phosphorous in metal. Both these impurities combine with the matrix elements to form low-melting-point (lower than that of the matrix) compounds, thereby reducing intergranular cohesion. The lack of cohesion between grain boundaries, in turn, initiates cracks aided by tensile stresses resulting from the contraction of the weld. Hot cracking is also known as "solidification cracking," which occurs in weld metals when a molten weld metal freezes, and "liquation cracking," which occurs in the heat-affected zones of the mother metal and weld metal in solid, affected by the heat of the arc. Hot cracking usually occurs longitudinally along the weld axis, occurring at the middle of the weld, however it can also take place across the weld axis affected by the direction of tensile stress. 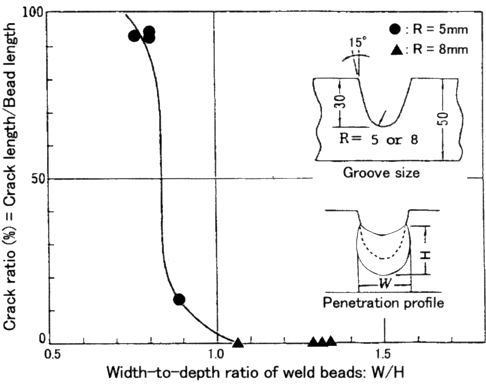 Figure 1 shows a longitudinal hot crack appearing on the surface of a weld. 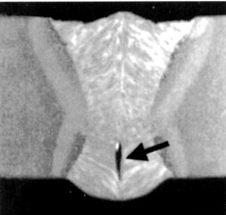 Another hot crack, shown in Figure 2 is a longitudinal hot crack that occurred inside the weld metal. Hot cracking can be prevented by employing adequate precautions as discussed below, except for some alloys that are inherently very susceptible to hot cracking in arc welding. The use of lower heat input increases the cooling speed of the weld metal, which minimizes the time spent in the brittle temperature range. It also increases the width-to-depth ratio of weld metal, thereby decreasing the susceptibility to hot cracking. The use of welding joints with a larger groove radius increases the width-to-depth ratio of weld metal, which prevents hot cracking ― Fig. 3. When welding austenitic stainless steels, use filler metals containing ferrite (normally 3-10% in weld metal) in the austenitic matrix. For special purposes (e.g. cryogenic temperature uses) where a fully austenitic weld metal is required, use a filler metal containing low sulfur and phosphorus with increased manganese content.